NASA, the NOAA, National Weather Service, and FEMA convened this last weekend for the GOES-R launch, an advanced weather satellite. This past weekend was monumental for NASA. At the Kennedy Space Center in Cape Canaveral, Florida, NASA department heads, the National Weather Service, NOAA and government officials, namely FEMA convened to announce the successful launch of the first weather satellite of the Geostationary Environmental Operational Satellites (GOES-R) program. According to the National Oceanographic Atmospheric Administration (NOAA), the GOES-R satellite launch was the first of at least four satellites which will be used to monitor weather patterns through 2036. These next-gen geostationary weather satellites will take weather forecasting beyond its normal constraints. Stationary and polar orbiting satellites will provide constant, up-to-date monitoring and reporting of ever-changing weather patterns in different regions of the western hemisphere. The GOES-R satellite is projected to update NASA of weather conditions at regular intervals from every five minutes to as frequent as every 30 seconds. As reported by the Deputy Weather editor for The Washington Post, Angela Fritz, the NOAA will be sharing two satellites between seven countries. These include the U.S., E.U., Japan, Russia, S. Korea, India, and China. Participating countries will share information in real-time to monitor developing weather patterns such as those contributing to the development of hurricanes, tornados, thunderstorms, flash floods and tsunamis, just to name a few. With real-time observation of weather conditions, the GOES-R website claims the satellite will aid in planning safe, efficient routes for air travel around the world. The up-to-date data can also empower government agencies like FEMA to disseminate valuable information regarding effective rescue efforts or evacuation plans to residents of regions affected by inclement weather. Other benefits include more reliable Data Collection Systems (DCS), GRB Rebroadcast and Search and Rescue Satellite Aided Tracking (SARSAT) and High Rate Information Transmission/Emergency Managers Weather Information Network (HRIT/EMWIN). 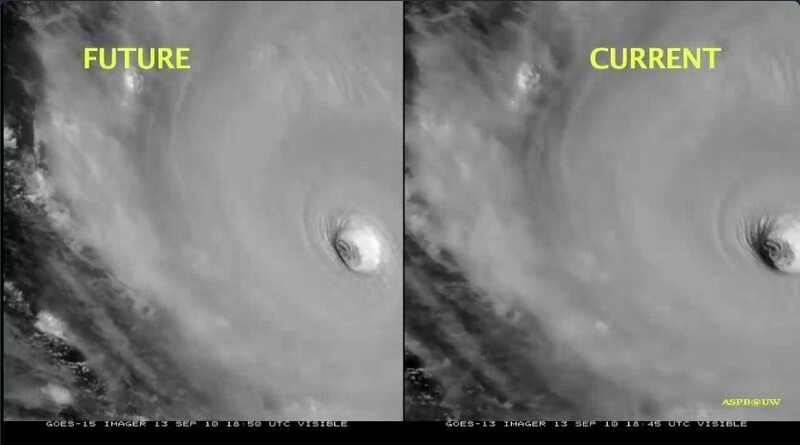 Check out the video below for a comparison between the new GOES-R and the current GOES satellite monitoring systems. With the advent of real-time weather forecasting, what long-term benefits do you expect or hope for with this GOES-R program? Please leave comments below and discuss with us what you think of this cutting edge technology.